CAMILLE SAINT-SAËNS (1835-1921): Works for Piano Duo, Vol. 3 - 2 Pianos: La Jota aragonese, Op. 64*, Cavatina, Op. 8/2*, Tarentelle, Op. 6*, Danse macabre, Op. 40, 4 Hands: Duettino, Op. 11, Feuillet d’Album, Op. 61, Vers la victoire, Op. 152*, Bénédiction nuptiale, Op. 9*, Sur les bords du Nil, Op. 125*, Septet, Op. 65*. * - First Recordings. Description: Not only are the duo transcriptions here rarely heard but four of the works they are transcriptions of are pretty obscure also: one organ piece, one for harmonium and piano and two for military band. 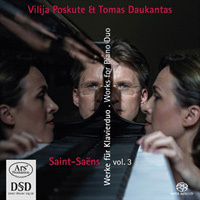 Vilija Poskute & Tomas Daukantas (piano[s]).